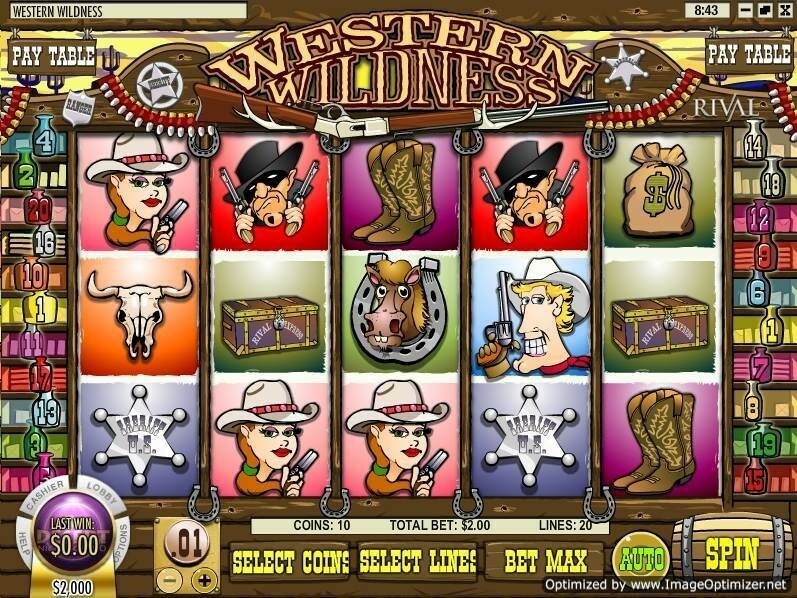 Western Wildness is a 5 reel 20 payline slot machine. In the movie intro scene you have the cowboy, the cowgirl and the villain showing off their shooting skills. This is brilliantly done. The next is the play screen which shows you symbols of the cowboy, cowgirl, the masked bandit who looks suitably menacing, flashy cowboy boots, a bag full of dollars, the sheriff's badge, a trunk which probably contains a lot of money and with Rival Express written on it. There is also the box of bullets, the horse shoe and the shotgun. So, what you have here is a machine which has a fun filled western theme with splendid graphics and background sound. During the spins you have fast paced sound effects with the piercing sound of bullets thrown in. During wins and combinations the symbols are animated. Some of the good ones include the cowboy spinning his gun in true macho style. Another excellent animation is of the cowboy boots dancing a jig. The maximum jackpot is 500 coins (you will need 5 of the treasure chest symbols to win this) and this amounts to $125 if you're playing with a coin size of $0.25 which is the maximum possible. You can wager up to 200 coins per spin (10 per payline X 20 paylines). This slot is great for all you cowboy and cowgirl wannabes.